Precious metals plunged this week but recovered a bit from earlier settlement lows that had ranged from almost 13 months for palladium to nearly 10 years for platinum. Gold fell for a second straight week, with this week’s its biggest decline in more than a year, while silver extended its streak of weekly losses to 10 in a row. Gold for December delivery on Friday edged up 20 cents to settle at $1,184.20 an ounce on the Comex division of the New York Mercantile Exchange. "It used to be that investors looked much more broadly at a basket of currencies when valuing gold," Bloomberg News quoted Rick Rule, chief executive officer of Sprott U.S. Holdings Inc., who’s been involved in the market for four decades. 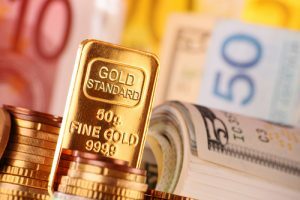 "It seems now that the dollar really has obtained hegemony, and the consequence of that is that the fight really does seem to be between the dollar and gold, and gold seems to be losing. I don’t think that that continues, but I can’t tell you when that changes." Gold futures fell 2.9% this week after slipping 0.3% last week. The weekly loss, notes MarketWatch, was the biggest since the week ended May 5, 2017. On Thursday, gold ended at its lowest point since Jan. 6, 2017. The yellow metal is down 9.6% on the year to date. "A total of 2,411 voters responded in a Main Street survey. Of these, 1,796 respondents, or 74%, predicted that gold prices will be lower in a week. Another 414 voters, or 19%, said gold will rise, while 150, or 6%, see a sideways market. Respondents who voted in the Twitter portion of the Main Street poll were slightly bullish, however. Twitter voters leaned bullish by 45% to 41%, although this sampling (114 votes) was far smaller than the online poll. Meanwhile, 14 market professionals took part in the Wall Street survey. Eight respondents, or 57%, called for higher prices, while five, or 36%, said lower. One respondent, or 7%, predicted a sideways market." Elsewhere Friday, silver for September shed 8.2 cents, or 0.6%, to settle at $14.631 an ounce. Silver futures dropped 4.3% this week, sinking a combined 12.6% in their ten straight weekly losses. On Wednesday, silver prices ended at their worst level since Feb. 2, 2016. The metal has fallen 14.7% on the year. October platinum declined $7.20, or 0.9%, to $777.30 an ounce, for a 6.3% weekly loss. On Wednesday, platinum registered its lowest close since late 2008. Palladium for September delivery added $3, or 0.3%, to $877.80 an ounce, but declined 2.6% on the week. On Wednesday, platinum posted its weakest settlement since July 7, 2017. Both are down on the year to date with losses of 17.2% for platinum and 17.3% for palladium. Gold declined $2, or 0.2%, to 1,178.40 an ounce. Silver rose 5.5 cents, or 0.4%, to $14.66 an ounce. Platinum declined $2, or 0.3%, to $779 an ounce. Palladium added $10, or 1.1%, to $895 an ounce. In LBMA results for the week, the losses reached 3% for gold, 4.7% for silver, 5.9% for platinum, and 1.8% for palladium. Gold bullion coins increased by 14,000 ounces this week after rising by 15,000 ounces last week. Splits included 5,500 ounces in American Gold Eagles against 6,000 ounces previously, and 8,500 ounces in American Gold Buffalos compared to 9,000 ounces previously. Silver bullion coins moved up by 690,000 this week after climbing by 235,000 last week. For a seventh week in a row sales came entirely from American Silver Eagles.